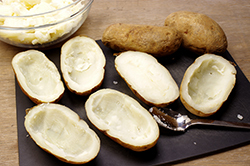 As potatoes themselves do, the skins step lively after a barbecue bath. 2. 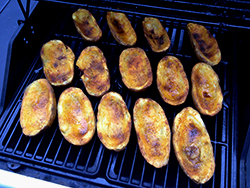 Prepare the smoker for barbecuing, bringing the temperature to 200°F to 220°F. 3. 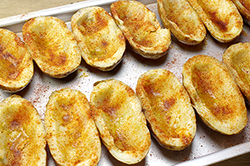 Rub the potato skins with a thin coat of butter or oil. Sprinkle the skins, inside and out, with the rub or other dry spice mixture. 4. Transfer the skins to the smoker and cook until they are browned and crispy, 55 to 65 minutes. 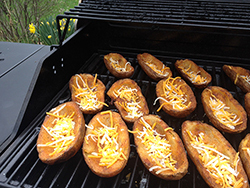 Sprinkle the cheese over the skins and cook for an additional couple of minutes, until the cheese melts. 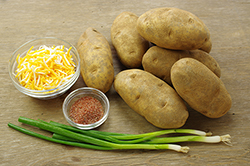 Top with the scallions. 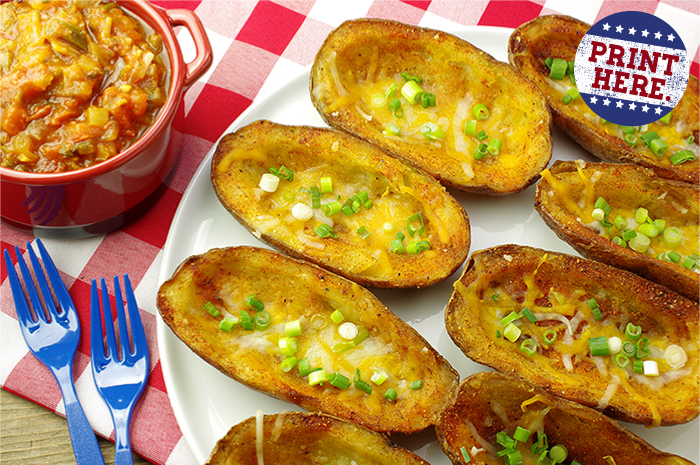 Serve piping hot with Sauce Olé. This is our main all-purpose rub, good on ribs, brisket, chicken, and more. 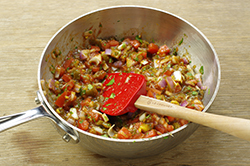 A chunky, salsa-style sauce that enhances barbecued pork, smoked turkey, or our Nachos Blancos. 1. Combine the ingredients (starting with just 2 tablespoons of the lime juice) in a saucepan and bring the mixture to a simmer over medium heat. Cook for approximately 10 minutes, enough to slightly thicken the sauce. 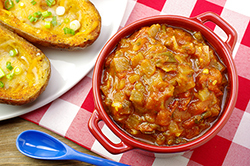 The vegetables should soften a little yet still stay crisp-tender. Taste and add additional lime juice if desired. 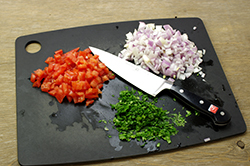 Refrigerate the sauce for at least 1 hour to allow the flavor to develop. 2. Serve the sauce chilled. It keeps, refrigerated for several days. 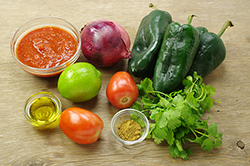 VARIATION: GREEN SAUCE OLÉ: Substitute an equal amount of pureed fresh or canned tomatillos for the canned crushed tomatoes and reduce the amount of lime juice to 1-1/2 to 3 teaspoons.